I've never been to Utah, but someone did recently bring me back a few chocolates from Utah. I've reviewed one chocolate bar already and I have one more after this. 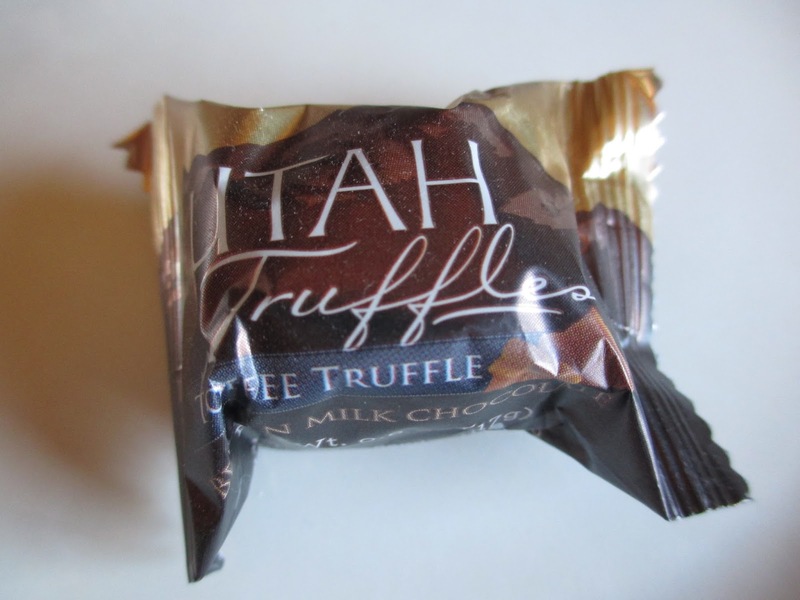 Today's subject, though, isn't just from a shop in Utah--it's also from a Utah Company, Utah Truffles to be exact. 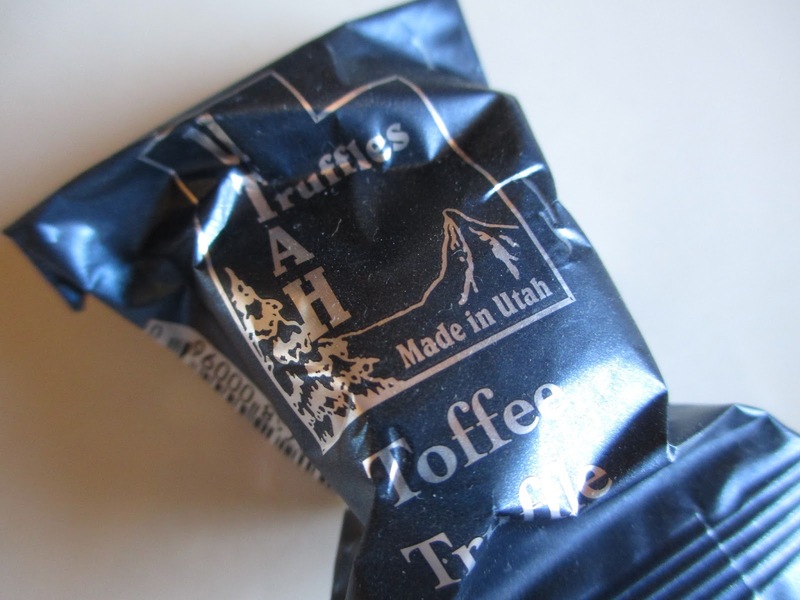 I have three of them: a Toffee Truffle, a Mint Truffle, and another Toffee Truffle in different packaging. Now, seeing the word truffle made me think I'd have to get to these straightaway. Turns out, though, that they have quite the long shelf life: the the best by dates aren't until December and April. In their shiny wrappers, they have a similar look to Godiva's wrapped truffles, but even Godiva's only last about three months (according to their shopkeeper). So I walked in knowing that these weren't going to be "truffles" in the traditional sense if they could have a shelf life of several months. I'm not entirely sure what is going on with the different packaging. It's possible that they switched styles and one is the old version. Or perhaps the two Toffee Truffles are slightly different. The one in blue says "Made in Utah" while the other two say nothing of the sort. I would think, however, that if one is made in the state, then they all are. The chocolate, however, is Belgian--and I think everyone knows by now that I see no need to import chocolate from Belgium when there is perfectly good chocolate in the U.S. (and usually the chocolate I come across here that's called Belgian is cheap, so I'm always suspicious if the name is used as a draw). I only took pictures of the other two truffles because the packaged-in-blue one was a little smashed. 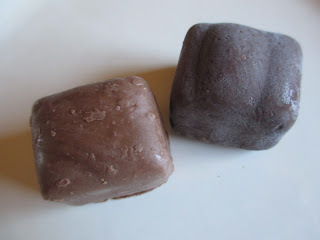 The visual difference between the two Toffee Truffles was a bit of shaved chocolate on top of the blue one. It also seemed slightly lighter in color: it's pretty watered down chocolate what with added cocoa butter, butter oil, and coconut oil. There is no ganache center to these three truffles: the whole thing is just a creamier version of chocolate. I suppose, for watered down chocolate, it's alright. It is creamy and there is some flavor to the chocolate. The toffee element is a series of small toffee bits that are big enough to have a texture presence; the effect is similar to the way in which crisped rice is strewn about the chocolate in a Crunch bar. Again, it's alright, but this isn't a truffle. The other Toffee Truffle is mostly the same. At least, the toffee element is exactly the same. The chocolate is somewhat denser and tastes more like caramel, so the ingredients must be mixed in at slightly different proportions. They're similar enough, though, that I don't have a preference of one over the other. The Mint Truffle is the weakest of the three. It's the only one with dark chocolate (because mint almost always needs dark chocolate rather than milk), but I'm an advocate of sticking to milk chocolate if you're just making sweet confections: otherwise the dark just feels awkward and halfway and not quite right. 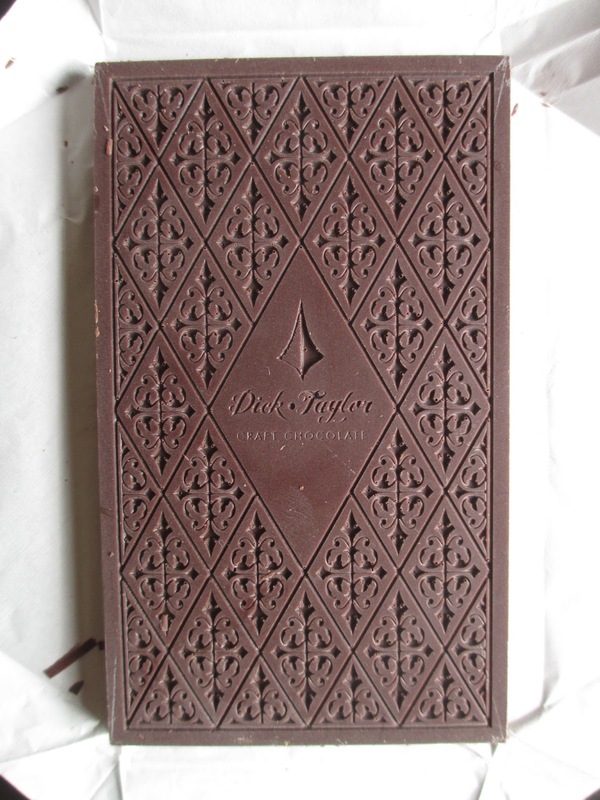 This chocolate, however, is light and sweet and watered down enough that it doesn't really taste dark in any way. So that isn't exactly an issue. And the mint, while not exactly fresh-tasting, tastes pretty much exactly like that of a Girl Scouts Thin Mint cookie, especially combined with this chocolate. So if you're a Thin Mint fan, you'll enjoy this chocolate. My issue, though, is with a weird side taste that I'm finding. I don't think it's from the coconut oil because I didn't get it in either of the other two chocolates. So it's either from cheap peppermint or somehow from the chocolate. Whatever the case, it ruins the effect. It isn't that the packaging here implied fresh and gourmet. It's just that one word: truffle. These aren't truffles, so I really wish they weren't labelled as such. They don't look like truffles and they don't taste like truffles. They're also not fun confections: they're more like grocery store chocolates than confections. They're nice enough as a little something sweet, but the chocolate is either not good enough quality to begin with or watered down too much for these to be anything more than sweets. Three years ago, I stumbled on the Santa Barbara, California company Twenty-Four Blackbirds while trying their Madagascar bar. Now someone has brought me from a little shop in Utah the Cedeno bar. Given how much I enjoyed the Madagascar bar (click here to read that review), I've been excited to try this new one. It has the same natural packaging, just with a slightly different design on the front of the brown paper. It's also in the same tiny 14 gram size, perfect for when you just need chocolate for right now. 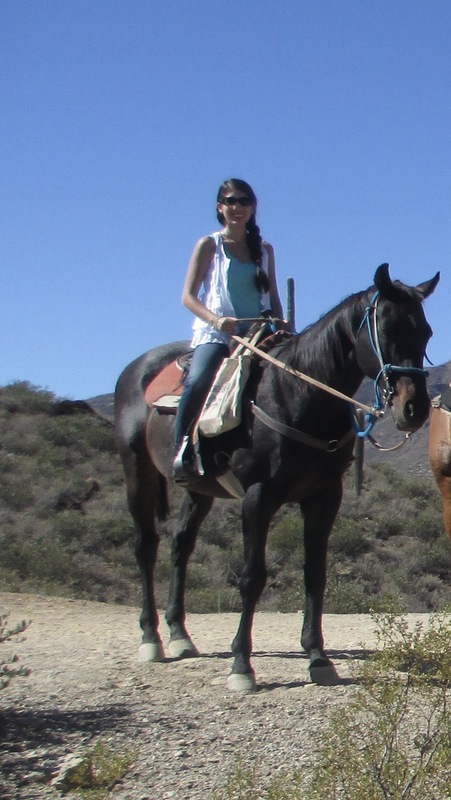 I couldn't think of having heard of Cedeno chocolate before, so it made sense to learn that Cedeno is the name of the family who own the farm where the cocoa beans to make this chocolate were grown. The farm is in Santo Domingo in Ecuador, and while I've certainly had chocolate sourced from there, it does seem to be one of the less common sources. Now, the best by date on here is September 2016, so I should have gotten to it sooner; I was just taking something of a break after all of the chocolate I brought back from Santa Fe. 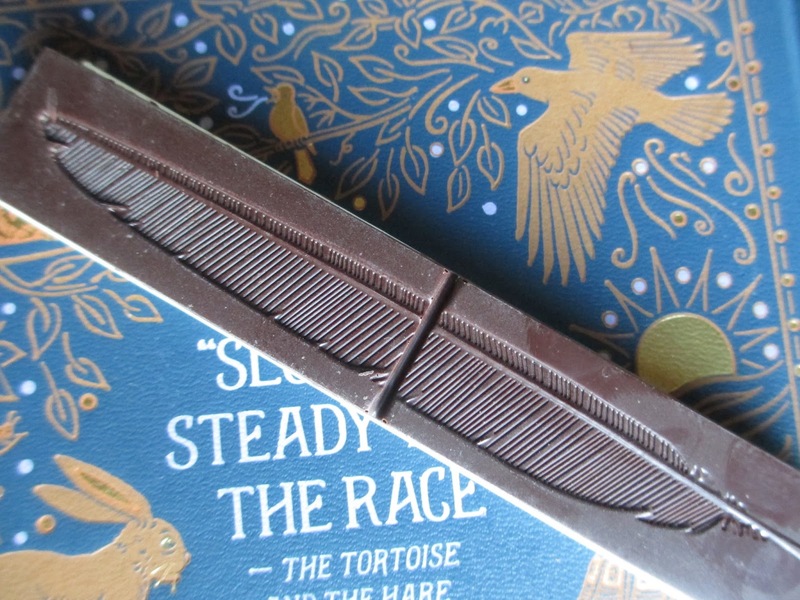 Still, we're not too far past September and the chocolate doesn't yet look or feel old, though it's true that it doesn't look as perfect as that Madagascar bar did. This chocolate begins with a deep flavor, what I call brownie darkness, the flavor of heavy chocolate cake. It tastes of silver and blue, and it's ever so slightly dustier in texture than what I remember from my last encounter with Twenty-Four Blackbirds. The flavor mainly becomes mellow, almost Christmasy or wintry in some way; perhaps it reminds me of mint or of spices. 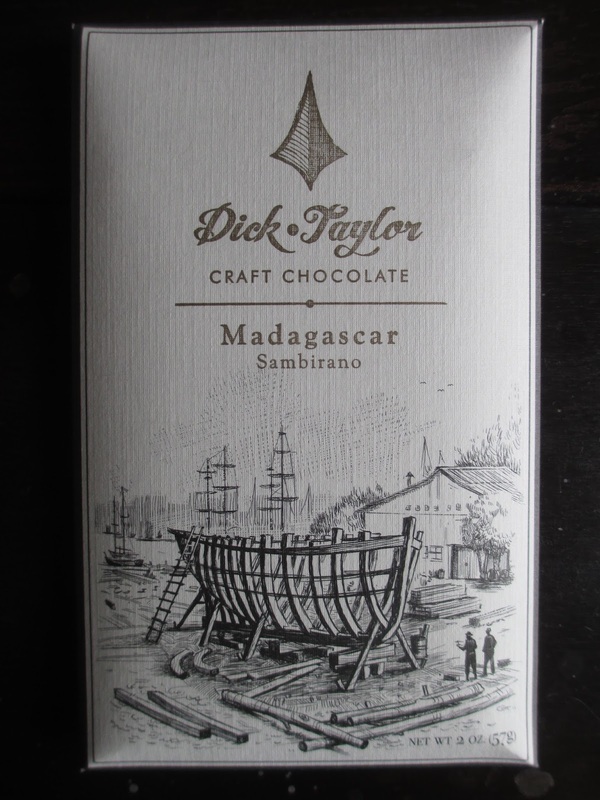 Both texture and flavor become richer and thicker as the chocolate melts; this point is full-bodied, finishing with a nice warm aftertaste that gives just a hint of spice. The overall effect of this chocolate is a flavor that doesn't change and yet a flavor that does intangibly develop into its own type of taste journey. From what I wrote last time, I'd say that I do still prefer the Madagascar to the Cedeno. The flavor profile here is simpler. Twenty-Four Blackbirds, on their website, describes it this way: "lightly sweet floral notes upfront, followed by a rich and deep cocoa flavor, that finishes with notes of walnut and almond." Warm and inviting. So it's certainly still a nice little chocolate. 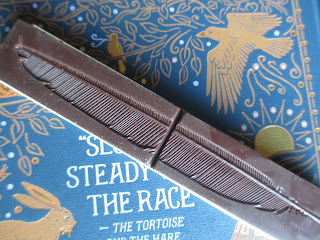 Twenty-Four Blackbirds, especially with this small bar size, satisfies a certain chocolate need. Simple and nicely done.